With rumors that startup Fabulonia has technology to combat the problems of copyright in 3d printing, we wanted to define the central copyright issue of 3d printing. What are people most concerned about with copyright and 3d printing? What is the copyright issue that keeps big companies from entering 3d printing? The real issue is large companies trying to protect their copyrights from unauthorized use. Big companies have invested huge amounts of money in building their brand. Some items are instantly recognizable as coming from a source – Disney’s Mickey Mouse, Universal’s Star Trek Enterprise, HBO’s throne from Game of Thrones, Lucasfilm’s (Disney’s) Yoda. The company owns the idea, not a particular incarnation of that idea. The idea is the company’s intellectual property. Many companies are overly protective of their copyrights and use the system to try to block valid use, but the system is in place to encourage creativity and originality. Even before 3d printing, people could copy these characters and imitate the designs. In general, big companies like that people enjoy their brand so much they make fan projects around their products. But because of the way copyright is set up, if a company does not show that they are trying to protect that copyright, it slowly can become public domain. The modern vision of Santa Claus as a fat bearded man may have started with storefront displays around the turn of the 20th century. If that origin story is true, no company claimed copyright, and the idea spread through the public freely. If Disney doesn’t show they are spending money protecting the image Mickey Mouse and ensuring the only real version of Mickey is Disney’s, Mickey could enter the public domain and be used in any designs. Because they protect the copyright, another company can’t make a “Future Mickey” character that would capitalize on of all the marketing that’s gone into Mickey Mouse without paying Disney through licensing fees. There is a narrow range of exceptions allowed for people to use the image of Mickey. Parody, commentary, and education are all examples of fair use of a design. 3d printing doesn’t change any of this. 3d printing makes it easier to make copies of things. It’s likely infringing to draw a cartoon starring Mickey Mouse and sell that cartoon. 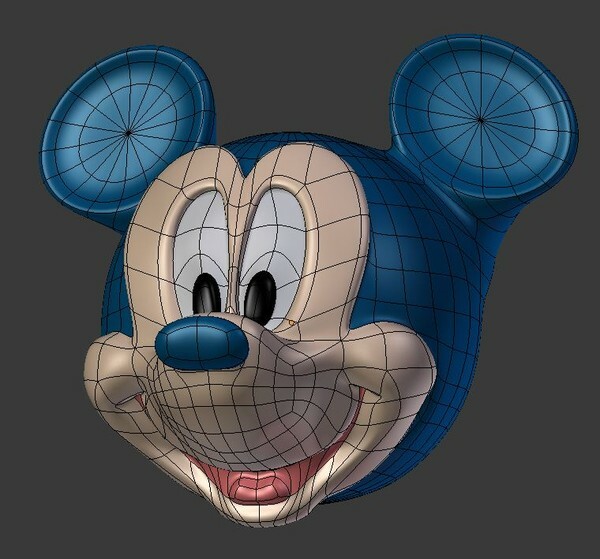 Making and distributing a 3d sculpture of Mickey Mouse with 3d printing is infringing in the same way. People who have Super Mario models on Shapeways for sale are in most cases clearly infringing on Nintento’s copyrights. This isn’t limited to just big companies. Individual artists have copyright of their original designs. The filigree skull that became famous through Kickstarter is from one artist, Joshua Harker. When the 3d marketplace 3DLT was caught using the model’s image as a placeholder, they were called out for stealing that artist’s content. Copyright exists to protect the ideas of both companies and individuals. One of the best explorations of many of the issues of copyright and 3d printing is the Public Knowledge study “What’s the Deal with Copyright and 3d Printing“. 3d printing companies are already working on creating full systems where anyone can scan in an object and create a duplicate of it. 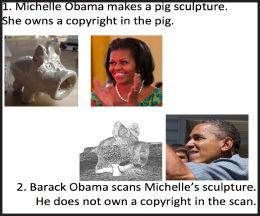 Just like photocopying a book and selling the copy is illegal, selling a 3d scan of a copyrighted object is illegal. If you own the item, you are probably safe copying it for your own personal use or as a physical backup. The problem is people scanning in objects and offering the designs for sale through Shapeways or other 3d marketplaces. Even if it’s not a 3d scan, if it’s hand designed and obviously the character or design from a copyright, unless it’s a fair use or licensed, that 3d model is infringing on the copyright. Just as MP3s disrupted the music copyright system by making it extremely easy to share sounds, 3d model files make it very easy to share physical designs. Since the MP3 revolution, we’ve developed algorithms to compare a song to a database of copyrighted songs. Google uses some of these algorithms to detect Youtube videos using copyrighted songs and automatically disable them. We don’t yet have efficient algorithms for 3d object recognition. We can detect if an object matches exactly, but general recognition is a long way away. Even if there were filters on 3d marketplaces to detect identical objects, users could just slightly change the model and it would pass the filters. You can move the arm on a yoda model and get it past the filters. Enforcing copyright on 3d designs at the moment has to be a manual process. Just as in the past, copyright will end up being policed by companies noticing infringing use and taking action. 3d printing will just make it harder for companies to protect their intellectual property. Big companies may want to use 3d printing, but they are wary both of people just copying their design files without paying for them. We’ve seen with DVD and Blu-Ray DRM that if the content is actually displayed or used, DRM can be broken. Since 3d printers eventually convert the 3d printing files into physical movement instructions, no 3d printing DRM can be completely successful. But copying original 3d design files is not the central copyright issue. 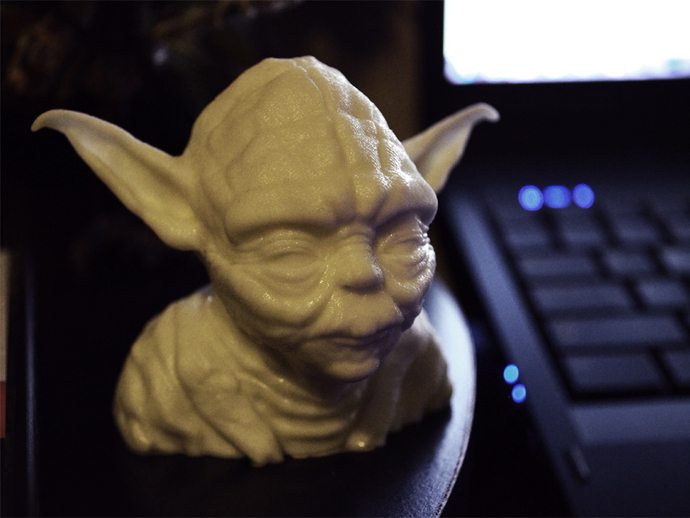 The central issue is that anyone can make a model of Yoda’s head or any other copyrighted material and share it easily with the rest of the world. They might do it with a 3d scanner, or manually with design software. This problem is the same problem record companies face with MP3s, movie companies face with video files, and visual artists face with image files. People can create and easily share or sell content that infringes copyrights. If that’s the central issue around copyright and 3d printing, we doubt Fabulonia or anyone else has a true solution to the copyright issues of 3d printing.